"Unreal technology" redirects here. For science or technology which is beyond reality, see science fiction. The first generation Unreal Engine was developed by Tim Sweeney, the founder of Epic Games. Sweeney, who already had experience on creating editing tools, such as those programmed for ZZT (1991) and Jill of the Jungle (1992), began writing the engine in 1995 for the production of a game that would later become known as Unreal, a first-person shooter. After years in development, it debuted with the game's release in 1998, although licensees such as MicroProse and Legend Entertainment had possessed the technology much earlier, with the first licensing deal taking place in 1996. Both software and hardware rendering were present in the foundational software, as well as collision detection, colored lighting, and a rudimentary version of texture filtering. The engine also provided a level editor, UnrealEd (formerly Unreal World Editor), that had support for real-time constructive solid geometry operations as early as 1996, allowing mappers to change the level layout "on the fly". Other features implemented during the engine's development included real-time direct illumination and light sourcing, which were respectively integrated in 1995 and 1997. In addition to having support for Microsoft Windows, Linux and Mac, Unreal Tournament also opened the platform to PlayStation 2 and, with the help of Secret Level, to Dreamcast. In 2000, Epic updated the engine with new improvements, including higher-polygon models and architecture, a skeletal animation system and large-scale terrain support. By late 1999, The New York Times indicated that the number of external projects using Epic's technology was 16, naming the likes of Deus Ex, The Wheel of Time and Duke Nukem Forever, the title from 3D Realms that was set to debut the series on the GameCube console. While it cost around $3 million to produce and licenses for up to $350,000, Epic gave modders the ability to create their own worlds with the incorporation of UnrealEd and a scripting language called UnrealScript in its games, sparking a community of enthusiasts around a game engine built to be extensible and improved over multiple generations of games. The big goal with the Unreal technology all long was to build up a base of code that could be extended and improved through many generations of games. Meeting that goal required keeping the technology quite general-purpose, writing clean code, and designing the engine to be very extensible. The early plans to design an extensible multi-generational engine happened to give us a great advantage in licensing the technology as it reached completion. After we did a couple of licensing deals, we realised it was a legitimate business. Since then, it has become a major component of our strategy. 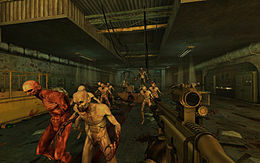 Killing Floor was built in Unreal Engine 2. The second version made its debut in 2002 with America's Army, a free multiplayer shooter developed by the U.S. Army as a recruitment tool. Though based on previous technology, this generation saw the renderer completely re-written, and the inclusion of a variety of features such as the Matinee cinematic editing tool, export plug-ins for 3D Studio Max and Maya, and the Karma physics engine, a tool by Math Engine that powered the ragdoll physics in Unreal Tournament 2003. In addition, it featured UnrealEd 2, which debuted with the previous generation of the engine and was shortly followed later by UnrealEd 3. Other engine elements were also updated, with improved assets as well as adding support for the Xbox. UE2.5, an update to the original version of UE2, improved rendering performance and added vehicles physics, a particle system editor for UnrealEd, and 64-bit support in Unreal Tournament 2004. A specialized version of UE2 called UE2X was used for Unreal Championship 2: The Liandri Conflict on the original Xbox platform, featuring optimizations specific to that console. In March 2011, Ubisoft Montreal revealed that UE2 was successfully running on the Nintendo 3DS. Screenshots of Unreal Engine 3 were presented in 2004, at which point the engine had already been in development for over 18 months. Unlike Unreal Engine 2, which still supported fixed-function pipeline, Unreal Engine 3 was designed to take advantage of fully programmable shader hardware. All lighting calculations were done per-pixel, instead of per-vertex. On the rendering side, Unreal Engine 3 provided support for a gamma-correct high-dynamic range renderer. The first games released using Unreal Engine 3 were Gears of War for Xbox 360, and RoboBlitz for Windows, which were both released on November 7, 2006. Throughout the lifetime of UE3, significant updates were incorporated, including improved destructible environments, soft body dynamics, large crowd simulation, iPod Touch functionality, Steamworks integration, a real-time global illumination solution, and stereoscopic 3D on Xbox 360 via TriOviz for Games Technology. DirectX 11 support was demonstrated with the Samaritan demo, which was unveiled at the 2011 Game Developers Conference and built by Epic Games in a close partnership with NVIDIA, with engineers working around the country to push real-time graphics to a new high point. While Unreal Engine 3 was quite open for modders to work with, the ability to publish and sell games made using UE3 was restricted to licensees of the engine. However, in November 2009, Epic released a free version of UE3's SDK, called the Unreal Development Kit (UDK), that is available to the general public. In December 2010, the kit was updated to include support for creating iOS games and apps. Interactive architectural visualization made in UE4. In August 2005, Mark Rein, the vice-president of Epic Games, revealed that Unreal Engine 4 had been in development since 2003. Until 2008, development was "basically" done by Sweeney. The engine targets the eighth generation of consoles, PCs, and Tegra K1-based devices running Android announced in January 2014 at CES. In February 2012, Rein said "people are going to be shocked later this year when they see Unreal Engine 4". Unreal Engine 4 was unveiled to limited attendees at the 2012 Game Developers Conference, and video of the engine being demonstrated by technical artist Alan "Talisman" Willard was released to the public in June 7, 2012 via GameTrailers TV. One of the major features planned for UE4 was real-time global illumination using voxel cone tracing, eliminating pre-computed lighting. However, this feature has been replaced with a similar but less computationally-expensive algorithm prior to release for all platforms including the PC due to performance concerns. UE4 also includes new developer features to reduce iteration time, and allows updating of C++ code while the engine is running. The new "Blueprints" visual scripting system (a successor to UE3's "Kismet") allows for rapid development of game logic without using C++, and includes live debugging. The result is reduced iteration time, and less of a divide between technical artists, designers, and programmers. I could say: 'I'm going to convert this pillar into a blueprint [in the Engine] and add some sort of trap to it.' It means I can really go in and start enhancing my world with interaction that just would not have been possible without a technical artist, a designer and a programmer and now any one of those three can do all of it, provided they have the assets handy. The fact that I can just go in and say, 'If you're within X distance of this thing, start to glow and take my distance to it, normalize it zero to one and then just lerp [oscillate] between two different brightness values, so as I reach for something it gets hot'...that would have been something do-able but very difficult for anybody except a gameplay programmer. And he wouldn't have known how to set up the assets, but now any one of the three could do it. On March 19, 2014, at the Game Developers Conference (GDC), Epic Games released Unreal Engine 4 through a new licensing model. For a monthly subscription at US$19, developers were given access to the full version of the engine, including the C++ source code, which could be downloaded via GitHub. Any released product was charged with a 5% royalty of gross revenues. The first game released using Unreal Engine 4 was Daylight, developed with early access to the engine and released on April 29, 2014. During the March 2015 Game Developers Conference, Epic announced that they would release Unreal Engine 4, along with all future updates, for free for all users. In exchange, Epic established a selective royalty schedule, asking for 5% of revenue for products that make more than $3,000 per quarter, as well as establishing an Unreal Marketplace for users to sell content with Epic taking a cut of sales from this as well. Sweeney stated that when they moved to the subscription model in 2014, use of Unreal grew by 10 times and through many smaller developers, and believed that they would draw even more uses through this new pricing scheme. In an attempt to attract Unreal Engine developers, Oculus VR announced in October 2016 that it will pay royalty fees for all Unreal-powered Oculus Rift titles published on their store for up to the first $5 million of gross revenue per game. To prepare for the release of its free-to-play "Battle Royale" mode in Fortnite in September 2017, Epic had to make a number of Unreal Engine modifications that helped it to handle a large number (up to 100) connections to the same server while still retaining high bandwidth, and to improve the rendering of a large open in-game world. Epic will incorporate these changes into future updates of the Unreal Engine. With the opening of the Epic Games Store in December 2018, Epic will not charge the 5% revenue fee on games that use the Unreal Engine and released through the Epic Games Stores, absorbing that cost as part of the base 12% cut Epic is taking to cover other costs. UnrealScript (often abbreviated to UScript) was Unreal Engine's native scripting language used for authoring game code and gameplay events before the release of Unreal Engine 4. The language was designed for simple, high-level game programming. The UnrealScript interpreter was programmed by Sweeney, who also created an earlier game scripting language, ZZT-oop. At the 2012 Game Developers Conference, Epic announced that UnrealScript was being removed from Unreal Engine 4 in favor of C++. Visual scripting would be supported by the Blueprints Visual Scripting system, a replacement for the earlier Kismet visual scripting system. With Unreal Engine 4, Epic opened the Unreal Engine Marketplace in September 2014. The Marketplace is a digital storefront that allows content creators and developers to provide art assets, models, sounds, environments, code snippets, and other features that others could purchase, along with tutorials and other guides. Some content is provided free by Epic, including previously offered Unreal assets and tutorials. Prior to July 2018, Epic took a 30% share of the sales but due to the success of Unreal and Fortnite Battle Royale, Epic retroactively reduced its take to 12%. ^ "Unreal Engine End User License Agreement". Unreal Engine. Retrieved August 26, 2018. ^ "Unrealengine.com Traffic, Demographics and Competitors". Alexa Internet. Archived from the original on January 9, 2019. Retrieved January 12, 2019. ^ Sweeney, Tim (2005). "GPU Gems 2 – Foreword". Nvidia Developer. Archived from the original on October 3, 2017. Retrieved October 3, 2017. ^ Edwards, Benj (May 25, 2009). "Features - From The Past To The Future: Tim Sweeney Talks". Gamasutra. Archived from the original on August 9, 2017. Retrieved November 18, 2018. ^ a b Nutt, Christian (March 21, 2014). "Epic's Tim Sweeney lays out the case for Unreal Engine 4". Gamasutra. Archived from the original on October 3, 2017. Retrieved October 3, 2017. ^ Keighley, Geoffrey. "Blinded By Reality: The True Story Behind the Creation of Unreal". GameSpot. Archived from the original on May 19, 2001. Retrieved October 3, 2017. ^ Horvath, Stu (May 17, 2012). "The Imagination Engine: Why Next-Gen Videogames Will Rock Your World". Wired. Condé Nast. Archived from the original on May 30, 2015. Retrieved February 6, 2015. ^ Buecheler, Christopher. "Tim Sweeney discusses the Unreal Engine". GameSpy. Archived from the original on June 21, 2001. Retrieved October 3, 2017. ^ Lightbown, David (January 9, 2018). "Classic Tools Retrospective: Tim Sweeney on the first version of the Unreal Editor". Gamasutra. Retrieved August 22, 2018. ^ Lily, Paul (July 21, 2009). "Doom to Dunia: A Visual History of 3D Game Engines". Maximum PC. Archived from the original on July 24, 2009. Retrieved July 5, 2009. ^ "Unreal". boot. No. Aug/Sep 96 (Special Premiere Collector's ed.). p. 87. Retrieved May 22, 2018. ^ Smith, Tom (July 16, 2013). "Unreal: Epic's would-be Doom... er... Quake killer". The Register. Archived from the original on August 12, 2017. Retrieved August 13, 2017. ^ Wilson, Billy; O'Brien, Chris; Heir, Manveer; Howarth, Robert (May 25, 2000). "Talkin' nasty with Epic's Tim Sweeney". Voodoo Extreme. Archived from the original on June 20, 2000. Retrieved August 13, 2017. ^ a b Thomsen, Mike (February 23, 2010). "History of the Unreal Engine". IGN. Archived from the original on July 12, 2017. Retrieved August 13, 2017. ^ a b Burnes, Andre (June 8, 2012). "Epic Reveals Stunning Elemental Demo, & Tim Sweeney On Unreal Engine 4". NVIDIA. Archived from the original on June 10, 2012. Retrieved June 12, 2012. ^ Kosak, Dave. "Talking with Tim Sweeney about the evolution of a game engine". GameSpy. Archived from the original on June 21, 2001. Retrieved August 13, 2017. ^ a b c Herz, J.C. (December 2, 1999). "GAME THEORY; For Game Maker, There's Gold in the Code". The New York Times. Archived from the original on September 19, 2017. Retrieved September 24, 2017. ^ IGN Staff (December 8, 2000). "Interview With Dreamcast Unreal Tournament Team". IGN. Retrieved August 10, 2017. ^ IGN Staff (September 11, 2000). "New Features in Unreal Engine Shown". IGN. Archived from the original on August 12, 2017. Retrieved August 13, 2017. ^ "Duke Nukem Forever to GameCube". IGN. May 10, 2001. Archived from the original on September 24, 2017. Retrieved February 4, 2018. ^ Reinhart, Brandon. "Postmortem: Epic Games' Unreal Tournament". Gamasutra. Archived from the original on July 29, 2017. Retrieved February 4, 2018. ^ "History of Unreal - Part 1". beyondunreal.com. May 31, 2005. Archived from the original on July 7, 2011. Retrieved July 5, 2009. Probably the biggest draw to Unreal was the ability to mod it. Tim Sweeney (Founder of Epic) wrote a simple scripting engine into the game called UnrealScript. ^ Busby, Jason; Parrish, Zak & Wilson, Jeff (July 21, 2009). "Introduction to Unreal Technology". InformIT. Archived from the original on September 30, 2012. Retrieved August 8, 2009. ^ a b McDonald, T. Liam. "Game Theory". Maximum PC. Vol. 3 no. November 1998. p. 43. ISSN 1522-4279. ^ McLeroy, Carrie (August 27, 2008). "Improving "America's Army"". U.S. Army. Archived from the original on November 19, 2017. Retrieved August 11, 2017. ^ Kennedy, Brian (July 11, 2002). "Uncle Sam Wants You (To Play This Game)". The New York Times. Archived from the original on December 13, 2017. Retrieved December 12, 2017. ^ McLean-Foreman, John (April 6, 2001). "An Interview with Epic Games' Tim Sweeney". Gamasutra. Archived from the original on August 22, 2017. Retrieved August 22, 2017. ^ Parker, Sam (March 22, 2002). "GDC 2002: Unreal technology, new benchmark". GameSpot. Archived from the original on September 8, 2017. Retrieved September 8, 2017. ^ Salvator, Dave (March 27, 2002). "GDC 2002 Show Wrap-Up". ExtremeTech. Archived from the original on September 8, 2017. Retrieved September 8, 2017. ^ Edge Australia. "The unreal thing". Edge Australia. No. 1. p. 68. Retrieved August 26, 2017. ^ Parrish, Kevin (March 25, 2011). "Ubisoft: 3DS Can Handle Unreal Engine 2". Tom's Guide. Archived from the original on January 21, 2016. Retrieved January 28, 2016. ^ Ivan, Tom (March 24, 2011). "Ubisoft: We have Unreal Engine running on 3DS". Computer and Video Games. Future plc. Archived from the original on February 9, 2015. Retrieved February 9, 2015. ^ Reed, Kristan (July 1, 2004). "Unreal Engine 3 Interview". Eurogamer. Archived from the original on March 15, 2013. ^ a b Maximum PC. "Game Engines – Exposed!" (PDF). Maximum PC. No. Fall 2004 (Special ed.). Future US. pp. 59, 62–64. Retrieved August 11, 2017. ^ Caron, Frank (March 13, 2008). "Unreal Engine 4 to "exclusively target" next-gen consoles". Ars Technica. Retrieved January 22, 2019. ^ Crossley, Rob (December 20, 2010). "Unreal Engine 3 game comes to Android [Update 1]". Develop. Archived from the original on August 11, 2017. Retrieved August 11, 2017. ^ De Vere, Kathleen (January 6, 2012). "A Top-Grossing iOS Game Like Epic's Infinity Blade II Can Earn More Than $5 Million a Month". Adweek. Archived from the original on August 11, 2017. Retrieved August 11, 2017. ^ Grant, Christopher (September 19, 2011). "Unreal Engine 3 comes to Mac OS X, courtesy of September UDK release". Joystiq. Archived from the original on January 19, 2012. ^ Sottek, T.C. (October 7, 2011). "Adobe Flash 11 adopts Unreal Engine 3 for better browser games". The Verge. Archived from the original on July 6, 2017. Retrieved August 11, 2017. ^ Crossley, Rob (June 7, 2011). "Wii U powered by Unreal Engine 3 tech". Develop. Archived from the original on August 11, 2017. Retrieved August 12, 2017. ^ Ligman, Kris (May 2, 2013). "See Epic's Unreal Engine 3 running in HTML5". Gamasutra. Archived from the original on August 11, 2017. Retrieved August 12, 2017. ^ Callaham, John (March 19, 2009). "Epic Games to show off new Unreal Engine 3 features at GDC". Big Download. Archived from the original on March 18, 2009. ^ Shimpi, Anand Lal (December 29, 2009). "Epic Demonstrates Unreal Engine 3 for the iPod Touch, iPhone 3GS". AnandTech. Archived from the original on July 8, 2012. ^ "Geomerics Enlighten". Archived from the original on July 11, 2011. 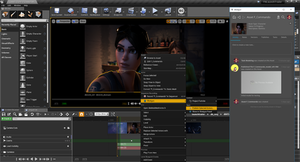 ^ "Geomerics Announces New Enlighten Integration with Unreal Engine 3". Archived from the original on June 5, 2012. ^ Ingham, Tim (June 17, 2010). "E3 2010: Epic makes 3D Gears Of War 2 - We've seen it. It's mega. But retail release not planned". Computer and Video Games. ^ "TriOviz for Games Technology Brings 3D Capabilities to Unreal Engine 3". Epic Games. October 6, 2010. Archived from the original on March 9, 2012. ^ Fletcher, JC (October 11, 2010). "Epic's Mark Rein goes in-depth with Unreal Engine 3's TriOviz 3D". Joystiq. Archived from the original on March 12, 2012. ^ Hamilton, Kirk (February 8, 2013). "Apparently, The Story Behind Epic's Dazzling 2011 Tech Demo Is A 'Doozy'". Kotaku. Archived from the original on October 6, 2014. Retrieved October 4, 2014. ^ Gies, Arthur (March 18, 2014). "Epic Games working on new, unannounced IP (UPDATE)". Polygon. Archived from the original on October 6, 2014. Retrieved October 4, 2014. ^ Gaudiosi, John (September 21, 2011). "Epic Games Founder Tim Sweeney Pushes Unreal Engine 3 Technology Forward". Forbes. Archived from the original on October 7, 2014. Retrieved October 4, 2014. ^ IGN Staff (November 5, 2009). "Epic Games Announces Unreal Development Kit, Powered By Unreal Engine 3". IGN. Archived from the original on September 15, 2014. Retrieved September 14, 2014. ^ Wilde, Tyler (March 19, 2014). "Unreal Engine 4 tools and source code now available for a $19 monthly subscription". PC Gamer. Future plc. Archived from the original on February 9, 2015. Retrieved February 9, 2015. ^ IGN Staff (December 16, 2010). "Epic Games Releases Unreal Development Kit With iOS Support". IGN. Ziff Davis. Archived from the original on September 15, 2014. Retrieved September 14, 2014. ^ Houlihan, John (August 18, 2005). "Rein: "We've been working on Unreal Engine 4 for two years"". Computer and Video Games. Future Publishing Limited. Archived from the original on January 10, 2014. Retrieved August 19, 2005. ^ Valich, Theo (March 12, 2008). "Tim Sweeney, Part 3: Unreal Engine 4.0 aims at next-gen console war". TG Daily. Tigervision Media. Archived from the original on December 12, 2009. Retrieved March 13, 2008. ^ Parrish, Kevin (February 11, 2012). "Epic Revealing Unreal Engine 4 Later This Year". Tom's Hardware. Retrieved March 1, 2012. ^ Shaw, Patrick (February 27, 2012). "Unreal Engine 4 Behind Closed Doors at GDC". Wired. Archived from the original on March 1, 2012. Retrieved March 6, 2012. ^ "Unreal Engine 4 - GT.TV Exclusive Development Walkthrough". GameTrailers TV. June 7, 2012. Retrieved August 22, 2018 – via YouTube. ^ Papadopoulos, John (April 20, 2013). "Epic Games' Tim Sweeney Explains Lack Of 'SVOGI' In Unreal Engine 4". Dark Side of Gaming. Retrieved February 14, 2018. ^ a b Grayson, Nathan (July 20, 2012). "Fortnite's Jessen Talks Minecraft, PC Gaming, UE4". Rock, Paper, Shotgun. Retrieved May 1, 2018. ^ Evangelho, Jason (May 22, 2014). "Why Is Epic Games Promoting Unreal Engine 4 With A 'Flappy Bird' Clone?". Forbes. Forbes, Inc. Archived from the original on February 8, 2015. Retrieved February 8, 2015. ^ Thier, Dave (June 29, 2012). "Epic's Tim Sweeney on How Unreal Engine 4 Will Change The Way Games Are Made, and Why You Care". Forbes. Archived from the original on October 6, 2014. Retrieved October 4, 2014. ^ a b Totilo, Stephen (June 8, 2012). "How Unreal Engine 4 Will Change The Next Games You Play". Kotaku. Archived from the original on October 24, 2012. ^ Orland, Kyle (March 19, 2014). "Unreal Engine 4 now available as $19/month subscription with 5% royalty". Ars Technica. Retrieved August 8, 2018. ^ "Zombie Studios Licenses Unreal Engine 4". unrealengine.com. December 18, 2012. Retrieved January 23, 2019. ^ "Making it in Unreal: How Daylight survived public pressure and became the very first UE4 game". PCGamesN. November 24, 2014. Retrieved January 22, 2019. ^ Batchelor, James (September 4, 2014). "Putting Unreal Engine in the classroom". Develop. Intent Media. Archived from the original on September 6, 2014. Retrieved September 5, 2014. ^ Sykes, Tom (September 5, 2014). "Unreal Engine 4 now free for academic use". PC Gamer. Retrieved April 4, 2018. ^ Nutt, Christian (February 19, 2015). "Epic Games offers up $5 million in Unreal Dev Grants". Gamasutra. UBM plc. Archived from the original on March 12, 2015. Retrieved March 11, 2015. ^ a b c Gaudiosi, John (March 3, 2015). "Why Epic Games is giving away its game technology". Fortune. Time Inc. Archived from the original on March 8, 2015. Retrieved March 13, 2015. ^ Sirani, Jordan (March 2, 2015). "Unreal Engine 4 is Free for Everyone". IGN. Ziff Davis. Archived from the original on March 14, 2015. Retrieved March 12, 2015. ^ Nutt, Christian (March 2, 2015). "Unreal Engine 4 is now free-to-download for everyone". Gamasutra. UBM plc. Archived from the original on March 15, 2015. Retrieved March 12, 2015. ^ Devin, Connors (September 3, 2014). "Epic Games Opens Unreal Engine Marketplace to Developers - Update". The Escapist. Retrieved August 21, 2018. ^ Graft, Kris (October 6, 2016). "Oculus, Epic make deal to give Unreal Engine devs a royalties break". Gamasutra. Archived from the original on October 30, 2016. Retrieved October 29, 2016. ^ McAloon, Alissa (October 4, 2017). "Developing Fortnite: Battle Royale prompted engine-wide Unreal improvements". Gamasutra. Archived from the original on February 24, 2018. Retrieved October 4, 2017. ^ a b c d e f Kumparak, Greg (April 3, 2014). "Unreal Engine 4 Gets Support For Making Linux And SteamOS Games". TechCrunch. Archived from the original on August 10, 2017. Retrieved August 10, 2017. ^ Cifaldi, Frank (March 29, 2013). "Interview: Epic goes all-in on HTML5 with UE4 support". Gamasutra. Archived from the original on August 10, 2017. Retrieved August 10, 2017. ^ Skrebels, Joe (October 16, 2016). "Nintendo Switch Will Support Unreal Engine 4". IGN. Archived from the original on August 1, 2017. Retrieved August 10, 2017. ^ a b Connors, Devin (April 24, 2014). "Epic Adds Xbox One, PlayStation 4 Support to Unreal Engine 4.1". The Escapist. Archived from the original on August 10, 2017. Retrieved August 10, 2017. ^ Koolonavich, Nikholai (March 19, 2018). "Magic Leap Release Developer SDK, Unreal Engine 4 Support Announced". VRFocus. Archived from the original on March 19, 2018. Retrieved March 19, 2018. ^ Kastrenakes, Jacob; Robertson, Adi (April 30, 2015). "Steam's virtual reality just got a boost from the maker of Unreal Tournament". The Verge. Archived from the original on August 10, 2017. Retrieved August 10, 2017. ^ Sykes, Tom (June 9, 2013). "Unreal Engine 4 gets Oculus Rift support, could spell good things for future indie games". PC Gamer. Archived from the original on August 10, 2017. Retrieved August 10, 2017. ^ Feltham, Jamie (June 5, 2014). "Unreal Engine 4.2 Update Adds Project Morpheus Support On PS4 & PC". VRFocus. Archived from the original on August 10, 2017. Retrieved August 10, 2017. ^ Graft, Kris (May 19, 2016). "Google's new VR headset gets Unreal Engine 4 support". Gamasutra. Archived from the original on August 10, 2017. Retrieved August 10, 2017. ^ Matney, Lucas (March 15, 2016). "Native OSVR support comes to Unreal game engine". TechCrunch. Archived from the original on August 10, 2017. Retrieved August 10, 2017. ^ Lang, Ben (September 16, 2014). "Samsung Gear VR and Google Project Tango Support Coming to Unreal Engine 4". Road To VR. Archived from the original on August 10, 2017. Retrieved August 10, 2017. ^ "UDN - Three - UnrealScriptReference". Udn.epicgames.com. Archived from the original on July 3, 2013. Retrieved June 26, 2013. ^ Schultz, Warren. "Unreal Engine 4 - First Look". About.com. Archived from the original on May 24, 2012. Retrieved December 29, 2017. ^ Wawro, Alex (March 1, 2017). "For Tim Sweeney, advancing Epic means racing into AR and VR". Gamasutra. Archived from the original on July 20, 2017. Retrieved July 19, 2017. ^ Brown, Fraser (September 4, 2014). "The Unreal Engine Marketplace is open for business". PCGamesN. Retrieved July 12, 2018. ^ Cowley, Dana (November 15, 2018). "Unreal Engine Wins Technology & Engineering Emmy® for Animation Production". Unreal Engine. Retrieved November 16, 2018. ^ "GDM January 2005". Game Developer Magazine. CMP United Business Media. January 2005. Retrieved July 15, 2016. ^ "GDM January 2006". Game Developer Magazine. CMP United Business Media. January 2006. Retrieved July 15, 2016. ^ "GDM January 2007". Game Developer Magazine. CMP United Business Media. January 2007. Retrieved July 15, 2016. ^ "GDM January 2008". Game Developer Magazine. CMP United Business Media. January 2008. Retrieved July 15, 2016. ^ "GDM January 2010". Game Developer Magazine. CMP United Business Media. January 2010. Retrieved July 15, 2016. ^ "GDM January 2011". Game Developer Magazine. UBM plc. January 2011. Retrieved July 15, 2016. ^ "GDM January 2012". Game Developer Magazine. UBM plc. January 2012. Retrieved July 15, 2016. ^ "GDM January 2013". Game Developer Magazine. UBM plc. January 2013. Retrieved July 15, 2016. ^ French, Michael (July 16, 2009). "Develop Awards: The Winners In Full". Develop. Archived from the original on July 22, 2016. Retrieved July 15, 2016. ^ Crossley, Rob (July 15, 2010). "Develop Awards: Unreal Engine wins tight race". Develop. Archived from the original on July 22, 2016. Retrieved July 15, 2016. ^ Hoggins, Tom (July 21, 2011). "Develop Industry Excellence Award winners announced". The Daily Telegraph. Archived from the original on July 22, 2016. Retrieved July 15, 2016. ^ French, Michael (July 10, 2013). "Game development stars honoured in Brighton". Develop. Archived from the original on July 22, 2016. Retrieved July 15, 2016. ^ Kayser, Daniel (July 14, 2016). "Unreal Engine 4 Wins Develop Industry Excellence Award for Best Engine". Unreal Engine. Epic Games. Archived from the original on July 22, 2016. Retrieved July 15, 2016. ^ Cowley, Dana (July 25, 2017). "Develop Industry Excellence Awards 2017: Best Engine". Unreal Engine. Archived from the original on August 5, 2017. Retrieved July 26, 2017. ^ Barton, Seth (July 12, 2018). "The Develop Awards 2018: All the winners!". MCV. Retrieved July 18, 2018. Wikimedia Commons has media related to Unreal Engine.